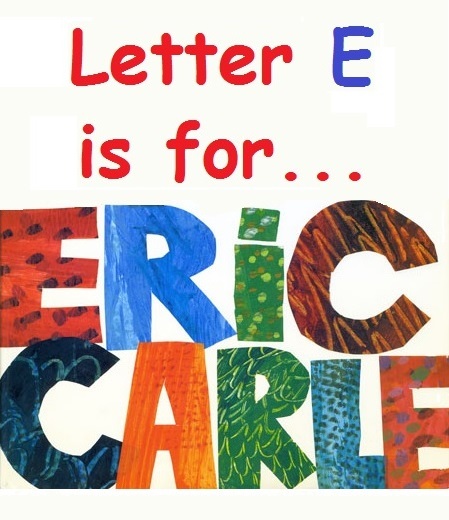 “Letter E is for Eric Carle Week” is next! Halloween week was SPOOKTACULAR! All week long, the students created various Halloween crafts to decorate their homes and help get into the Halloween spirit! Thank you for all of the great Halloween shares that were brought in to school throughout the week! Take a look below to see some of the spooky shares that were sent in! The first Halloween-themed craft of the week involved a particularly creepy crawler with eight legs! 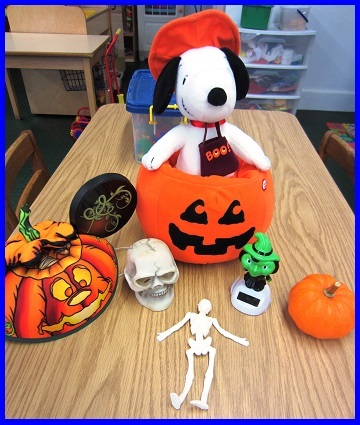 Do you know which Halloween creature the students made? If you said, “Spiders” than you are correct! The students squeezed and dripped glue onto a paper cutout. Using assorted colors of glitter, the gluey mess quickly became a sparkly spiderweb! The only piece that was missing was the spider, of course! A spooky spider ring for each student helped fix that! What a sparkly, fun, and wearable art project! The fun continued on Monday afternoon as the students welcomed back an old friend who was visiting from the wild world of Kindergarten! The PPA alum photographed below spent the afternoon with the students answering all of their questions about what kindergarten is like and also reading several books to the class! It is always so nice seeing old friends! What a wonderful visit it was! On Tuesday, the students created Boo-tiful ghosts using cotton balls and construction paper. With the addition of two eyes and a circle mouth, the expressive ghosts really turned out great! During the afternoon on Tuesday and Wednesday, the students had music class where they learned some fun Halloween songs. This one was a big hit! If you’re a ghost and you know it, just say Boo! continue with…. Cat, say Meow! After music, the students also worked to create a page in the first class book of the school year – The PPA Halloween Book! Here are a few excerpts! On Wednesday morning, the students turned into mad scientists as they spent the morning creating their own monster (puppets). First, they painted their “monster” bag green. Next, they gave their creature some features – eyeballs, hair, lips, etc. And of course, no monster is complete without bolts to hold it together! Needless to say, the mad “studen-tists” had a blast making their monsters come to life! Finally, the day had come – Thursday was Halloween! The students arrived at school in their Halloween costumes and boy, did they look great! Thursday afternoon was the PPA Halloween Party! Nearly all of the students (and their families) were in attendance and in costume too! After reading a silly story and singing a super silly Halloween song, the students marched around the classroom in their costumes! Once the parade had made its way through, the students had a chance to play and dance together as well as enjoy some special Halloween treats! What an amazing day it was! A special PPA thank you to all of the families who attended the Halloween Party. Be sure to scroll to the bottom of this blog entry to view ALL of the photographs from the 2013 PPA Halloween Celebration! The fun continued on Friday as the students returned to school, a bit sleepy from trick-or-treating the evening before. Sensing the need for a relaxing morning, the teachers set up the art easel and let each child create a “free paint” for morning work. As is always the case, the students’ creativity and artistic abilities were unbelievably impressive. Take a look to see a few proud artists at work! During the afternoon on Friday, the students were visited by a parent volunteer who came in to read a story to the students! What a sensational way to wrap up the week! A special PPA “Thank You” to this Daddy for coming in and spending the afternoon with us! Well, that is all for this week’s blog entry! We hope you all enjoyed “Halloween Week” as much as we did! As always, thank you for reading. Have a fun and safe weekend! Parent-Teacher Conferences begin on Monday. Please check your email or the school calendar board to confirm your scheduled time-slot.